Time out from caring responsibilities at our term-time young carers club sesssions in Farnborough (7-12 year olds: Wednesday evenings) and Yateley (13+ Monday evenings). Parents’ coffee mornings and one-to-one support. Additional opportunities for young carers to attend residential or overnight events with other young carers or to go on day outings. A young carer can be referred to our project by a member of their family, their school or college, or by a health and social care professional. Please contact us for a Request for Service form or click on the link to download a copy. Staying in the house a lot so they can be there for them. Helping them to get up, get washed or dressed, or helping with toileting. Doing lots of the household chores like shopping, cleaning and cooking. Looking after younger brothers and sisters. Providing emotional support or a shoulder to cry on. A parent has a disability or medical condition that makes it difficult for them to carry out household chores or other responsibilities. A parent is not receiving sufficient support from other adults or care services to manage at home. There is a brother or sister in the family with a disability or medical condition, and the adults need extra help. I think I might be a young carer, how can I find out more? I am a young carer, what should I do next? Talk to an adult – this could be one of your parents or other adult relatives, or someone at school or college. An adult may also then need to talk to someone, who works in social care. This is because any young person who is a young carer is entitled by law to their own assessment of their role as a carer. It is important for other adults, such as teachers and health professionals, to know that you are a young carer so that they can try to put as much support as is needed in place both for you and your family. Ask an adult to find out more about the Hart and Rushmoor Young Carers project (they can click on the Parents tab on this web-site). We have a simple form that is completed by the adult, which includes questions that should be discussed with you about what you think about your caring responsibilities. Once we have received the form, we will arrange a home visit to come and talk to you and your family about our young carers’ clubs, or you can arrange to visit one of our clubs with a member of your family. You are then welcome to join one of our clubs and meet with other young carers. What happens at young carers' clubs? Time for chatting with other young carers and with our youth workers if you wish. Regular youth club activities – games, crafts, sports etc. Other activities that might be useful for your caring role like cooking. Do you run other activities for young carers? Yes we do. We aim to offer a number of outings and one residential activity each year. There will also be an opportunity to meet other young carers living in Hampshire at joint events organised by the Hampshire Young Carers’ Alliance. What is the possible impact on a young person of being a young carer? Young people are often very happy to help their parents or relatives and it can be very positive for them. But children also have the right to be looked after, and to have their own time to play, develop and learn. Feelings of embarrassment or shame at having a relative with problems. Most ill or disabled parents do their best to minimise the effect of their difficulties on their children, and many young carers cope well with caring, especially with the support of other family members. But some may find caring for a relative very stressful at times. They might develop depression, anxiety or low self-esteem. They may feel angry with their relative at times, which can in turn fuel feelings of guilt. Where can I/we get help? Social Care: Young carers have the right to their own care assessment. This assessment is usually carried out by a social worker. Social workers in Hampshire are employed by Hampshire County Council (HCC). For enquiries about young carers’ assessments or support for a family where there is a young carer, please call HCC Children’s Services on 0300 555 1384 or e-mail childrens.services@hants.gov.uk The aim of this assessment is to ensure that the young person and his or her family gets access to appropriate local services, including, where needed, additional support for the adult or sibling being cared for. The assessment may result in a whole family plan, which will be agreed between the family and social services/other agencies. Hart and Rushmoor Young Carers Project: We provide clubs for young carers aged 8-17 who live in Hart or Rushmoor or who attend a school in Hart or Rushmoor. The clubs meet during term time in Farnborough on Wednesdays: 5.00-7.00 7-12 year olds and in Yateley on Mondays 7.00-8.30 13+years. Schools/Colleges: It is important to let schools and colleges know if the child or young person is a young carer, as teaching and pastoral staff can allocate additional support if needed. Schools may also be able to offer whole family support as well. GPs/Child and Adolescent Mental Health Services (CAHMS): If the young person is showing behavioural issues or emotional/mental health problems, please contact the young person’s GP. This may result in a referral to CAMHS or another NHS mental health service. Counselling: Hart Voluntary Action runs a youth counselling service and may be able to support a young carer aged 11-18 who lives in Hart or attends a Hart school. Please see more information on our youth counselling pages. If you live elsewhere in Hampshire or the Surrey/ Berkshire borders, do get in touch and we can give you details of other voluntary sector youth counselling services, which may be easier for you and your child to access. I/we would like to request support for our child, what happens next? Once we have received a request for support, we will arrange a home visit by one of our youth workers to meet with you and the young person. The aim is to understand from the family about how caring is impacting on the young person, but also for the family to get to meet and know the youth workers who run our Young Carers’ clubs. We can then arrange for the young person to join one of the clubs, including transport if this required. Can we come and visit one of the clubs to see what you offer? Yes, this can be arranged, please contact us to make arrangements. Visits must be arranged in advance. 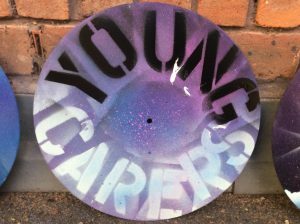 Do young carers have to attend each week? No they do not have to attend each week, but we would encourage a regular commitment from the young person to attend as it helps them to build friendships with other young people. However we understand that is not always possible for young people to attend, so we appreciate a phone call in good time to let our youth workers and volunteer drivers know. How long can young people attend for? Young people can attend our clubs for as long as they wish up until they are 18 or are completing their post-16 education. If young carers would like to continue after then, they could consider continuing as volunteer club assistants. What service does Hart and Rushmoor Young Carers provide? We provide clubs for young people aged 7-18. These are led by qualified youth workers employed by Hart Voluntary Action. The Clubs meet during term-time only, and we link in with other Hampshire Young Carers projects to provide additional outings and events for young carers. How do we refer families to your project? We have a Request for Support Form – see link at the top of this page – please ensure that this is as complete as possible and include the young person in feeding in their responses where indicated on the form. If there is more than one young carer in the same family, we will need a form completed for each young carer. Can you offer support to families with young carers under 7 years? Currently, we have no provision for young carers aged 6 or under, but we will take details of the family and contact them as soon as they are approaching their 7th birthday. Some young carers projects do offer support to younger young carers, please see the Hampshire Young Carers Alliance web-site for more information. Registered Charity no 1119912. Company Registered in England and Wales 5982733. Copyright 2019 Hart Voluntary Action. All rights reserved.